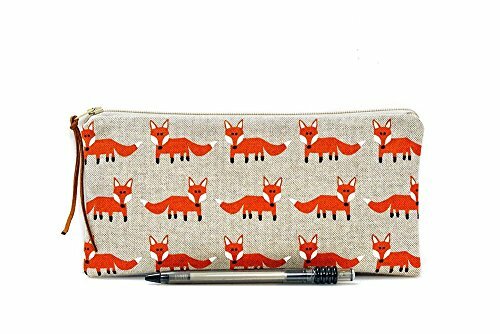 This cute handmade "pencil case/makeup bag" is made from linen cotton with foxes. It can be used not only for make up, pens and pencils but for many other " little" things. The case has a zipper closure, interfacing for keeping its shape and is fully lined with cotton. Great for yourself or as a gift. Measurements: approx. 8,75 x 4,3 inch (22x11 cm) For pencils, MakeUp, Passports etc. The pencil case is hand-crafted and therefore can give slight variations on the patterns shown. The lining may vary due to stock availablility but will always be matching the outer fabric. Colors may appear different due to monitor variations. Spot cleaning is recommended. If needed, hand wash in cold to handwarm water at gentle cycle. If you would like a customized item or if you have any questions or remarks about this product, please don't hesitate to send me a message. Thank you for visiting my shop. If you have any questions about this product by The Dutch Loft, contact us by completing and submitting the form below. If you are looking for a specif part number, please include it with your message. OFTO Raindrop Essential Oil Holder- Holds 10 Essential Oil Bottles, 2 Carrier or Massage Oil Bottles - Protects Surfaces from Oil Stains Eco-Friendly, All-Natural Finish - USA Handmade- Fast Shipping!